My own house on Thassos! Nature has been generous with this verdant Aegean island. Consider its countless, easy to reach beaches, where the pine trees literally dip their branches into the sea. 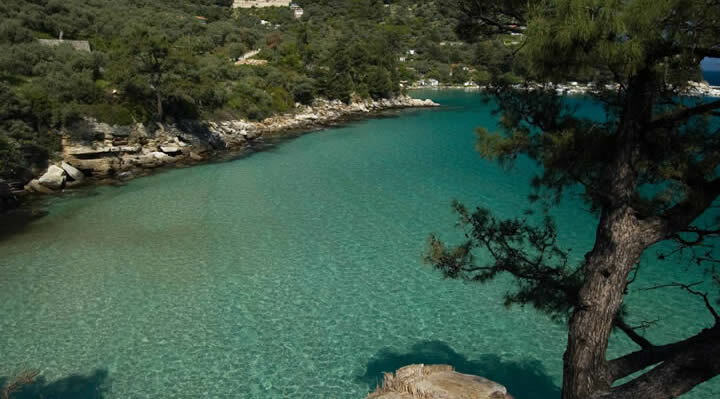 The combination of mountain and sea, green and blue makes Thassos a rare Aegean destination. Thassos island is easily accessible with ferry boats sailing in regularly. It lies just half an hour from Keramoti's port and one hour from Kavala, making it an ideal destination for a holiday home or a permanent residence. The numerous advantages this island has to offer, make it an excellent choice for owning a property. Whether you are looking for a small apartment or a villa with a private swimming pool, NEDON Constructions can make your wish for a home by the sea come true. Although mainly intended for a summer house, you will be able to visit your property on Thassos island throughout the whole year, due to the appropriate infrastructure, that enables you to use it also as a permanent residence. NEDON Constructions has been developing property on Thassos island for fifteen years, providing outstanding quality and elegance, picking ideal locations and fitting its settlements perfectly into the natural environment. In the ''Projects'' menu button you can find all our houses and apartments, which are in some cases offered at special discounted prices. Nedon Constructions is proud of its experienced personnel, which applies an all cutting edge technology in building detached houses and apartments on Thassos, offering privacy and relaxation, as well as the flavour of Greek traditional atmosphere, on privately owned land. The purchase of a tourist home, on Thassos island, at a discounted price, which will be rented and produce an attractive income every year. The buyer can sell the house to a third party, whenever he decides to, at a price that will yield an important capital gain. The option the investor has to use the residence himself completes an attractive package, that combines investment with holidays. Nedon Constructions offers the opportunity for a purchase of a holiday house on Thassos island, at a special discounted price. The company undertakes the rental of the house to tourists, if the buyer wishes that and the income is attributed to him. The house can also be offered for sale to a third party, whenever the buyer decides this, at a significantly higher price. This way, he will enjoy an attractive income from the rental every year and also have the potential to realize an important capital gain, if the sale of the house is achieved at the targeted price. Important to mention, is that tourists who rent a house and enjoy their accommodation in it, are potential buyers. 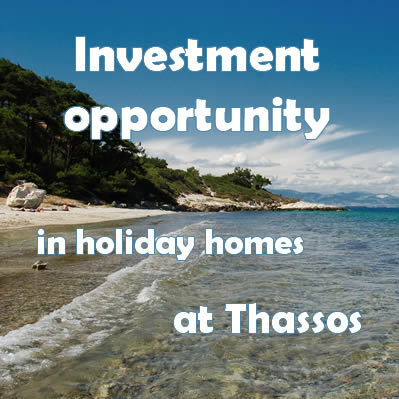 More than one investors can purchase a holiday house at Thassos, for instance in the case they are friends or relatives. Of course, the investor can stay at the house himself or allow his friends to use it, whenever he desires and they will enjoy their holidays on Thassos island. The proposal of Nedon Constructions refers to different types of houses that address a broad spectrum of investors, according to their financial condition. The improvement of the economies of the Balkan countries, combined with the lack of competitive holiday destinations in the region, has lead to a spectacular increase of the flow of tourists to the coasts of Northern Greece, in the last decade. The opening of new border posts, the improvement of motorways, the increase of airline connections and the higher frequency of sea routes are important factors for high demand for touristic services in Northern Greece. Eastern Europe and mainly Russia, which is a country with many millions of wealthy civilians, is also a very important market of tourists for Northern Greece. Cultural and religious bonds lead many people of these countries to prefer Greece for their holidays. 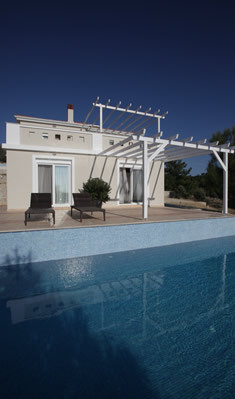 Nedon Constructions specializes in building holiday homes on Thassos island, since 1999. 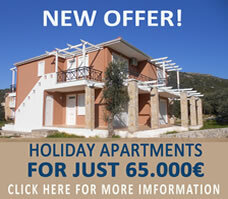 The company has accomplished the development and sale of more than 50 houses at various parts of the island. Its clients are people from neighboring cities of Greece, but also from other countries like Germany, Austria, England, Belgium, Russia, Ukraine, Slovenia, Serbia, Bulgaria etc. Thassos is the northest island of the Aegean, therefore the nearest to the Balkan countries. After the completion of the “Egnatia” highway, Thassos is easily accessible from the whole of Northern Greece. It takes only 35 minutes for the ferry boats to reach Thassos from the nearest mainland port, which is “Keramoti”. It is barely a few hours drive from Sofia, Bucharest, Belgrade, Istanbul and Thessaloniki, while the airport near Keramoti is connected with direct flights with many European cities and Moscow. Thassos is an island of rare natural beauty. Its splendid sandy beaches with crystal clear blue-green waters, blend in a unique way with the pine and olive trees, creating a marvelous combination of sea and mountain. The high demand for the rental of holiday houses, in combination with the attractive prices Nedon Constructions offers, create an excellent investment proposal.